The Avianca Vuela Visa Card currently has an Informr score of 8 out of 10. This score is based on our evaluation of 2 sources including reviews from users and the web's most trusted critics. 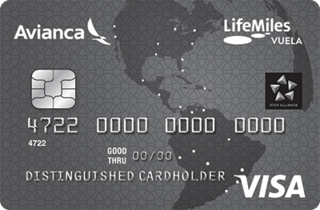 Avianca Vuela Visa Card is typically available to those with good credit scores (650 or greater). If you frequently fly between the US and South or Central America, the Avianca Vuela Visa Card could be an excellent choice. You’ll earn accelerated miles on Avianca purchases, and on purchases at gas stations and grocery stores. The Avianca Vuela Visa Card has some useful features and benefits, but it’s not the best airline rewards credit card. 40,000 Bonus LifeMiles after first card use.